Morning Edinburgh, here is another visual quiz for you to ponder this Monday morning. Can you name the Edinburgh location…? Remember WhereArtI runs every Monday in the Edinburgh Evening News with a fantastic prize each week. You could win a bottle of Edinburgh Gin plus a tour of their city centre distillery. Buy a copy today to find out more. WhereArtI update: This sketch is from the G&V Hotel (previously Missoni) on the corner of George IV Bridge and the Royal Mile. Well done @SteveWilson88 (3pts), @hattyjwood (2pts) and @0apropos (1pt). It’s the former Missoni, now G+V on George IV Bridge. Findlay Smith liked this on Facebook. @edinsketcher Is it the @GandVHotelEdi on George IV Bridge? Isa Haggis liked this on Facebook. Lynne Hodgson liked this on Facebook. Jake-Babs Herron liked this on Facebook. Lynn McKinlay liked this on Facebook. @edinsketcher nice drawing! Is it the new parliament building? 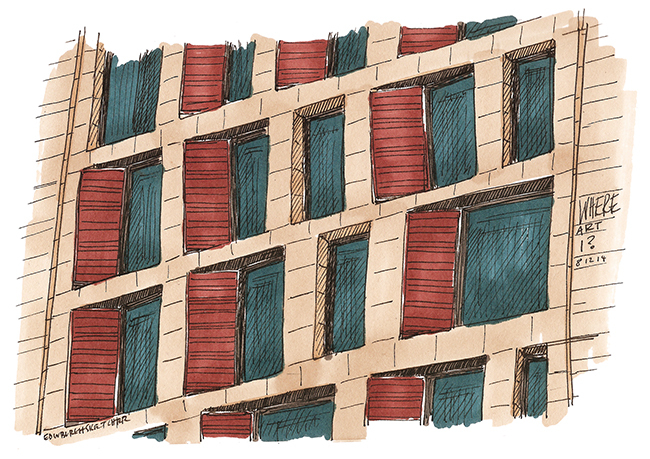 @edinsketcher bit late to the twitter table today..but this is Hotel Missoni on George IV bridge. Missoni Hotel? Bank on the corner George IV Bridge, Lawn Market. Is it Hotel G&V?? Hmmm, tricky one! @edinsketcher Hmm, tough! Is it the Informatics Dept at Edinburgh Uni? The g&v hotel on corner of George IV Bridge and High St?